After experimenting with lowering the amounts of sugar to egg whites, this is the lowest I have gone so far. 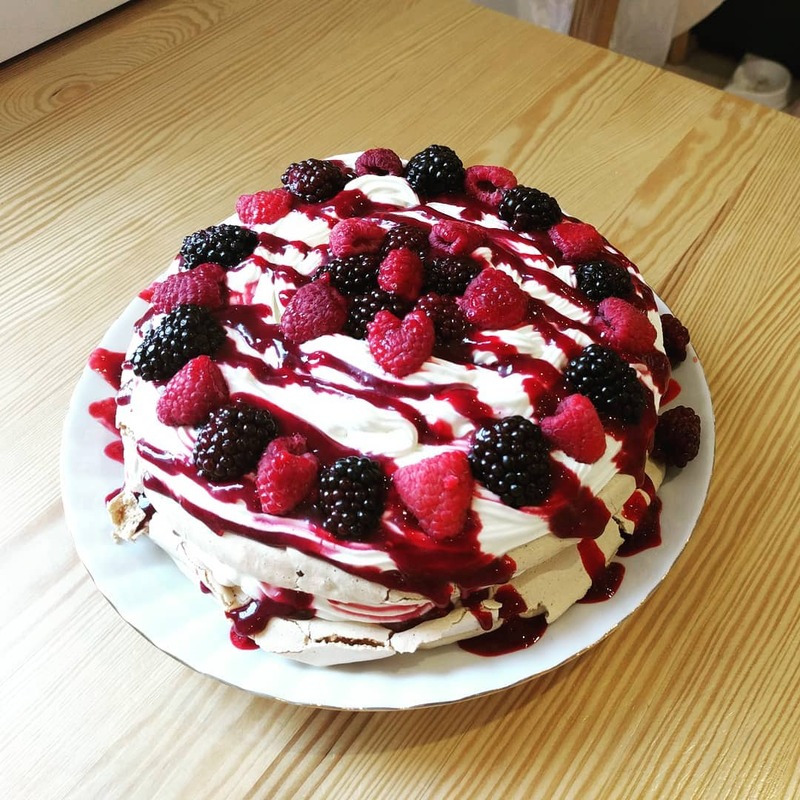 Prepare and cook the pavlova meringue a day before decorating and serving, as it needs to cool overnight in the oven. Preheat oven to 100 C Fan. On the underside of baking paper, draw 2 circles 17cm in diameter. Once stiff and glossy add the vanilla, whisk a little bit to combine. Once your pavlova is baked, turn the oven off, and leave it in there to cool overnight. Make the sauce. Put the berries, sugar and lemon zest into a saucepan and cook for about 20 minutes. Mix the cornflour with the lemon juice, and add into the saucepan. Cook until thickened. Cool in a bowl covered in clingfilm, making sure that the clingfilm is in contact with the sauce to prevent a film from forming. Make the cream filling. Whip the double cream until stiff, then add the yoghurt and sugar. Cover with the second circle and decorate in the same way. Serve immediately, the more time it stands, the more soggy the meringue will become.